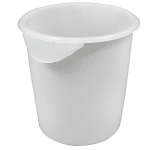 The Rubbermaid FG572400WHT round storage container is made of quick-cleaning white polyethylene and has an 8-quart capacity. It can be stacked to maximize space in storage areas and has built-in handles that assist the user when lifting and carrying the container. Dishwasher safe, this unit can withstand temperatures ranging from 35 to 150 degrees Fahrenheit.